Microsoft has recently launched its new Facebook App version 2.0 for Windows Phone users. Microsoft has not revealed the new version of Facebook App 2.0 publicly due to some up gradation. But if you are Windows Phone user and if you are using Windows Phone Marketplace than you can download the latest Facebook App Version 2.0 for your Windows Phone. 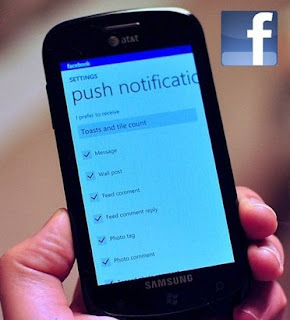 The biggest change which Microsoft has made in its new Facebook app version is addition of Push Notifications feature. You can now turn on notifications or a live tile count for the notifications. The new Facebook Push Notification feature is easily customizable. You can easily choose to be notified about a new Wall Posts, Messages, Feed Comments, Feed Comments Reply, Photo Comments, Photo Tag, Tagged Photo Comments, Photo comment reply etc. All of those are optional notifications, meaning you have complete control over what the app notifies you about. The new version is very stable and fast as compare to its previous release, for now we only have this limited information. We will update you more about the new features as soon as we get more information from Microsoft spokesman. Subscribe to this post for more info on this topic. You can download Facebook 2.0 for Windows Phone here.